Brittney Reese (born September 9, 1986) is an American long jumper, Olympic gold medalist, and a seven-time world champion. Reese is the indoor American record holder in the long jump with a distance of 7.23 meters. Born in Inglewood, California, Reese is a 2004 graduate of Gulfport High School, where she became state champion in the long jump and triple jump. She later attended MGCCC and the University of Mississippi. Reese was a member of the women's basketball team at MGCCC and was recently inducted into their sports Hall of Fame. Reese has been assistant track and field coach at San Diego Mesa College since 2013. She was the NCAA Outdoor Champion in long jump in 2007 and 2008. 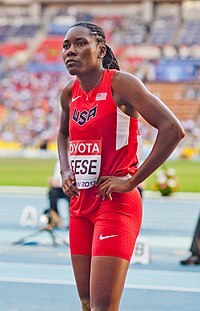 Reese set a personal best in the long jump of 22 feet 9.75 inches (6.9533 meters) in July 2008 in Eugene, Oregon at the U.S. Olympic Trials to qualify for the 2008 Summer Olympics in Beijing. At the Olympics, Reese had the best qualifying jump at 6.87 meters. However, Reese placed fifth in the final, with a jump of 6.76 meters. On May 24, 2009, in Belém, Reese extended her personal best to 7.06 m (0.7 m/s wind). This brought her to third on the American all-time list, behind Marion Jones and Jackie Joyner-Kersee. At the 2009 World Athletics Championships, in Berlin, Reese won the long jump title with a jump of 7.10 meters, beating defending champion Tatyana Lebedeva. Reese is the third youngest champion in the history of the event. At the 2010 IAAF World Indoor Championships, Reese won the gold medal in the long jump with a jump of 6.70 meters. At the 2011 World Championships in Athletics, Reese successfully retained the gold medal in the long jump with a jump of 6.82 meters. At the 2012 IAAF World Indoor Championships, Reese successfully retained the gold medal in the long jump with a jump of 7.23 meters. She became the first woman to win back-to-back World indoor titles in the long jump when she landed a 7.23 m last round effort, the longest mark indoors since 1989, a new American record and third on the all-time indoor lists. At the start of the outdoor season she broke Carol Lewis' long-standing meet record at the Mt SAC Relays with a jump of 7.12 m. That year, she also won the Olympic gold medal, with another jump of 7.12 m.
Reese won her third consecutive long jump world outdoor title at the 2013 World Championships in Moscow with a jump of 7.01m, beating Blessing Okagbare narrowly by 2 cm. Reese is currently represented by Mark Pryor of World Express Sports Management. On November 14, 2011, Reese donated 100 turkeys and her time to various homeless and religious organizations in her community of Gulfport, Mississippi as her way of "giving back" to the community that has supported her throughout her athletic career. She wanted to make Thanksgiving a little easier, in an area where there are few resources for those in need. On October 26, 2012, in conjunction with the Gulfport School District celebrating "Brittney Reese Day"; Reese created the B. Reese Scholarship which will be awarded annually to 1 male & 1 female student who has been accepted to a 2-year or 4-year college. On May 21, 2013, the Reese Scholarship was awarded in Baltimore County Public Schools to a deserving student accepted to college or university who participated in the Allied Sports Program, coordinated by the Office of Athletics Director Michael Sye. The 2014 recipient of the scholarship is Bailey Weinkam, a Catonsville High School student that was born hearing impaired. Ms. Weinkam will attend Community College of Baltimore County in Fall 2014. ^ Gex II, Joseph W. (August 14, 2012). "Brittney Reese - Coast's golden hero". Sea Coast Echo. Archived from the original on December 9, 2012. Retrieved November 11, 2012. ^ "Mesa College coach going for the gold at 2016 Olympics". San Diego Community College District. August 2, 2016. Archived from the original on August 18, 2016. ^ Biscayart, Eduardo (2009-05-25). Belém spectacular produces five world season leads – IAAF World Athletics Tour. IAAF. Retrieved on 2009-05-30. ^ (2009-08-23). Reese wins women's long jump at worlds. The Associated Press. Retrieved on 2009-08-24. ^ Laura Arcoleo (2009-08-23). Reese – ‘I knew I had it in me’ Archived August 26, 2009, at the Wayback Machine. IAAF. Retrieved on 2009-08-24. ^ Hart, Simon (August 28, 2011). "World Athletics Championships 2011: American Trey Hardee retains decathlon title as Ashton Eaton fades". The Daily Telegraph. Retrieved August 29, 2011. ^ "EVENT REPORT - Women's Long Jump - Final". iaaf.org. ^ Lee, Kirby (2012-04-22). World leads by Reese and Aarrass highlight Mt Sac Relays. IAAF. Retrieved on 2012-04-22. ^ "long jump women results - Athletics - London 2012 Olympics". Retrieved 2016-04-18. Wikimedia Commons has media related to Brittney Reese. "The Beast is Hunting Olympic Gold". Sports Illustrated.com. January 10, 2012. "Pistorius Advances to 400 Semifinals at Worlds". The New York Times. August 28, 2011.